Did you know that your future wife may be praying for you? Often we don't realize how important and powerful prayer is. It's not an exercise God asks us to do once in awhile for no apparent reason. It's not whimsically sending off a wish into the clouds. Your wife is not just a vague "someday," she is a real person that God sees and loves. She has desires, hopes, dreams, plans, joys, and struggles. Your prayers affect her life and shape who she is becoming. Won't it be amazing to someday finally meet her and see how the Lord worked through your faithful prayers? Maybe your wife is not yet saved and she needs the gospel. If so, you can begin by praying that your future wife will become a Christian. Maybe she is discouraged and needs hope, comfort, faith and prayer. There are so many things she could be going through right now and you can be an amazing force even now in her life. Your love can begin for her long before you meet. There have been quite a few amazing stories about the Lord burdening a guy or girl to pray for a specific need for their future spouse even when they didn't know each other. When they finally met each other they found that their spouse had been going through the very thing they had been praying for at that time. You could pray that God would give you a burden for your future spouse's specific need at this time. Pray for Godly character qualities you desire. (Obviously, don't make lists that are so picky she could never live up to them.) Pray she will be content as a single young lady as she waits for you. Pray she will hope in the Lord. Pray she will grow and mature. Above all, pray your wife would model Christ. As you pray, God will change your life, too. It's kind of funny how it works but when you begin to think about what you desire in your future spouse, God puts on your heart how you can grow and prepare to be a future spouse. You can care for and treasure her heart starting now. Becoming a faithful and loving husband doesn't start when you marry her, it starts now as you pray for her. 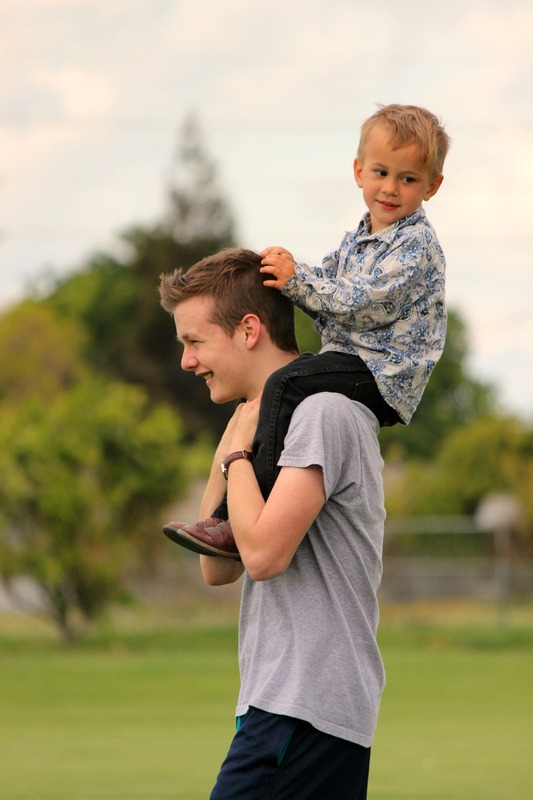 My brother, Justin, giving away free piggy back rides. I have hesitated to do this with my two brothers who still are at the age where I can "clue them in" and be an influence in their life. I have hesitated perhaps because of a number of reasons. Maybe because I never thought of myself as being a "training ground" for their future relationship with their wife or even just in the friendships they have now with young women. Maybe I thought they wouldn't listen. Or maybe I was just embarrassed to share a bit of my heart with my brothers. You know, brothers are just brothers. We don't often see them as future men who will grow up and have wives and families that they will lead. They're the "boys" I've grown up with all of my life, made mud forts with, and who I will always call "the boys". But no, these "boys" are men who are called on to be servant leaders and warriors for Christ. Protectors of women, physically, emotionally, and leaders of future homes. My brother, Jared, playing one of his favorite sports. It's easy to think that your brothers will just intrinsically know how to treat women. They'll know how women think and feel. They'll know what we do and do not appreciate in a man. They'll know our needs and how they can be met, and we often get frustrated when they don't get it right. But, we don't come with instruction manuals and without a woman in their life explaining things, they can't know how we operate. A woman speaking truth into their lives is a tool that can help shape a boy into a man. I want to grasp this opportunity that I still have with two of my brothers closest in age to me. I will be writing a weekly letter to them on topics ranging from "notice when they cut their hair" to vital things about relating to women. I wanted to share those letters here so that they could perhaps be an encouragement to you whether you're that brother or that brother's sister or mom. So, look out for my weekly posts called, "Letters To My Brothers" and follow me along on this letter writing journey to my brothers. I pray they can be of some encouragement to you, too. Even a small encouragement would be a success! Goodness knows I'll probably get some things wrong, but I will be attempting, with God's wisdom, to speak truth and encouragement into the lives of my brothers who are being molded into leaders and warriors for Christ.